Through the release of this document, Industry Canada hereby announces the decisions resulting from the consultation process undertaken in Canada Gazette notice SLPB-004-14, Consultation on the Technical, Policy and Licensing Framework for Advanced Wireless Services in the Bands 1755-1780 MHz and 2155-2180 MHz (AWS-3) , hereinafter referred to as the Consultation. All comments and reply comments received on this consultation are available on Industry Canada's website at http://www.ic.gc.ca/spectrum. Comments and/or reply comments were received from ABC Communications, Bell Mobility Inc. (Bell), Bragg Communications Inc. (Eastlink), Cogeco Cable Inc., First Mile Connectivity Consortium (FMCC), Globalive Wireless Management Corp. (WIND), Independent Telecommunications Providers Association (ITPA), K-Net Services (K-Net), McNally, McNally/Taylor/Middleton (McNally et.al. ), MTS Allstream (MTS), Niagara Networks Incorporated (Niagara Networks), Public Interest Advocacy Centre (PIAC), Québecor Media Inc. (Québecor), Rogers Communications Partnership (Rogers), SaskTel, SSi Group of Companies (SSi), Tbaytel, TELUS Communications Company (TELUS), and Xplornet. The following document (hereinafter referred to as the Framework) sets out the technical, policy and licensing framework for the advanced wireless service (AWS) bands 1755-1780 MHz and 2155-2180 MHz (hereinafter referred to as AWS-3). The decision includes: a new band plan; pro-competitive measures for the band; the auction process and rules for the AWS-3 auction; conditions of licence for the licences assigned through this process; and the interim technical requirements for the band. The Minister of Industry, through the Department of Industry Act , the Radiocommunication Act and the Radiocommunication Regulations , with due regard to the objectives of the Telecommunications Act , is responsible for spectrum management in Canada. As such, the Minister is responsible for developing goals and national policies for the use of spectrum resources and for ensuring effective management of the radio frequency spectrum resource. As discussed in the Consultation, Canadians have experienced many benefits since steps were taken in 2008 to increase wireless competition. New entrants have made substantial investments to deploy wireless networks in many markets across Canada and to provide wireless services to Canadians. More spectrum would allow these providers to increase network capacity in order to meet the traffic demands of a growing subscribership, and support the provision of next-generation wireless services, such as long-term evolution (LTE). Meanwhile, larger national and regional service providers would also benefit from an opportunity to access additional spectrum, allowing them to increase capacity to better serve their substantial subscriber bases. a sealed-bid, second-price auction process is to be held in March 2015 to make the spectrum available in a timely manner. Industry Canada was also guided by the general approaches and processes outlined in the Framework for Spectrum Auctions in Canada (FSAC) . Industry Canada makes no representation or warranties about the use of this spectrum for particular services. Applicants should be aware that this auction represents an opportunity to become a licensee, subject to certain conditions and regulations. An Industry Canada auction does not constitute an endorsement by the Department of any particular service, technology or product, nor does a spectrum licence constitute a guarantee of business success. Applicants should perform their individual due diligence before proceeding as they would with any new business venture. The AWS bands (AWS-1 Footnote 1 and AWS-3) are expected to be key bands for the deployment of LTE technology for North American wireless networks. It is also expected that the 3rd Generation Partnership Project (3GPP) standard for the AWS-3 spectrum will support 5 + 5 MHz, 10 + 10 MHz and 15 + 15 MHz block sizes, since LTE currently supports these block sizes and allows for the combining of adjacent blocks within the same band up to 20 + 20 MHz. Industry Canada proposed to use the same band plan (uplink at 1755-1780 MHz and downlink at 2155-2180 MHz) as currently used in the United States (Figure 1). However, the Department proposed that the three 5 MHz blocks, (G, H and I) be combined into one 15 + 15 MHz block, in addition to the 10 + 10 MHz block J. The Department proposed large blocks because they would allow licensees to benefit from increased throughput, capacity and network efficiencies. In addition, large blocks will allow service providers to aggregate more efficiently the AWS-3 blocks with their other spectrum holdings across the AWS-1 and other bands. Furthermore, combining the G, H and I blocks into one GHI block would still align sufficiently with the U.S. band plan to simplify coordination and minimize the risk of an incompatible equipment ecosystem. This figure shows the U.S. band plan for AWS-1 and AWS-3. AWS-1 is comprised of the bands 1710 to 1755 MHz and 2110 to 2155 MHz. AWS-1 includes block A from 1710 to 1720 MHz and 2110 to 2120 MHz, block B from 1720 to 1730 MHz and 2120 to 2130 MHz, block C from 1730 to 1735 MHz and 2130 to 2135 MHz, block D from 1735 to 1740 MHz and 2135 to 2140 MHz, block E from 1740 to 1745 MHz and 2140 to 2145 MHz, and block F from 1745 to 1755 MHz and 2145 to 2155 MHz. AWS-3 is comprised of the bands 1755 to 1780 MHz and 2155 to 2180 MHz. AWS-3 includes block G from 1755 to 1760 MHz and 2155 to 2160 MHz, block H from 1760 to 1765 MHz and 2160 to 2165 MHz, block I from 1765 to 1770 MHz and 2165 to 2170 MHz, and block J from 1770 to 1780 MHz and 2170 to 2180 MHz. Many of the proposals for the band plan were related to Industry Canada's proposal to set-aside 30 MHz of spectrum and make 20 MHz available to all bidders; see Section 6 for the decisions regarding these issues. Eastlink, K-Net, Niagara Networks, Québecor, Rogers, SaskTel, SSi, Tbaytel and WIND all supported the band plan and block structure as proposed with no modifications. PIAC supported the band plan but proposed disaggregating the blocks into three 5 + 5 MHz blocks or one 10 + 10 MHz and one 5 + 5 MHz block to allow for more than one operating new entrant to access the set-aside spectrum. They argued that combining smaller blocks across different bands using carrier aggregation technology could achieve the same result with respect to throughput and number of users served as would be achieved by licensing one large 15 + 15 MHz block to the new entrants. Bell and TELUS both suggested changes to the proposed band plan. Bell proposed to split the open block into two 5 + 5 MHz blocks to allow for more potential auction winners, and swap the open and set-aside blocks such that the two open blocks would be adjacent to the AWS-1 band in order to allow for contiguity of open and AWS-1 spectrum. TELUS proposed to reduce the set-aside spectrum to 20 MHz and highlighted that in the coming years, the AWS-1 and AWS-3 spectrum will be one homogeneous band; therefore, TELUS supported a band plan consisting of five equal blocks of 5 + 5 MHz. TELUS stated that technology will support block sizes of 5 + 5 MHz or 10 + 10 MHz. TELUS also proposed to swap the open and set-aside blocks. Bell supported TELUS's proposal for five equal blocks of 5 + 5 MHz. In the reply comments, Eastlink, Rogers and Québecor urged the Department to reject Bell's and TELUS's proposal to swap open and set-aside blocks because blocks G, H and I are already included in 3GPP band class 10; therefore, an equipment ecosystem may develop first for these blocks. Québecor underscored that swapping the set-aside and open blocks would result in Canadian and U.S. block structures being out of sync, which would complicate cross-border coordination and increase the risk of incompatible equipment ecosystems. Rogers also urged the Department to reject the proposals put forward by Bell and TELUS for splitting the open-bidding block into two blocks on the grounds that large blocks enable faster broadband speeds and more efficient use of spectrum. Both Québecor and WIND recommended that the Department not accept the proposals of Bell, TELUS and PIAC with respect to disaggregating the set-aside block. WIND stated that PIAC's proposal would hinder the effectiveness of the set-aside spectrum, which is dependent on the availability of one large contiguous block of spectrum. Although initially supporting the band plan proposed in the consultation, Xplornet indicated in its reply comments that it is more sensible to auction five blocks of 5 + 5 MHz, rather than a single block of 15 + 15 MHz and one block of 10 + 10 MHz. Xplornet argued further that new entrants do not have the customer base to justify an additional 30 MHz of AWS spectrum; therefore, auctioning five 5 + 5 MHz blocks could make this spectrum available to a larger number of carriers. TELUS also proposed to align with the U.S. AWS-3 auction and include the 1695-1710 MHz band in the auction. All respondents supported the pairing proposed by the Department on the grounds that harmonizing Canadian and U.S. band plans maximizes economies of scale and equipment availability, simplifies cross-border coordination and facilitates roaming. The majority of respondents also supported the proposed block structure, with Bell, TELUS, PIAC and Xplornet proposing modifications. The proposed changes can be grouped into three categories: placement of the blocks; number of blocks available for open bidding; and disaggregating the set-aside block. Placement of the blocks: Bell and TELUS's proposal to switch the set-aside and open blocks to ensure the contiguity of the open-bidding block with the AWS-1 band was not supported by other stakeholders. The Department notes that carrier aggregation (CA) technology will, in the near future, allow for blocks to be combined across different bands to form a larger virtual channel. This technological development will reduce the requirement for contiguous blocks of spectrum. Some parties opposed the switch on the basis that J block is not yet included in the 3GPP standard for the AWS-3 band. Footnote 2 However, U.S. service providers and numerous manufacturers have begun work in 3GPP on the AWS-3 extension band for LTE. Therefore, the lack of band class for the full band will likely be short-lived. Once work is completed on the band class within 3GPP, the Department expects that LTE devices that are operable across both AWS-1 and AWS-3 bands will become available. In light of the variety of views put forward by stakeholders and the above considerations, the Department sees no clear justification for switching the set-aside and open bidding blocks. Number of blocks available for open bidding: Bell, TELUS and Xplornet proposed dividing the open bidding spectrum from one 10 + 10 MHz block (as initially proposed by Industry Canada) into two blocks of 5 +5 MHz to enable a second bidder to access the spectrum. None of the commenters raised any technical or cost concerns regarding dividing the open bidding block. However, it is important to note that one contiguous 10 + 10 MHz block affords greater efficiency than two separate 5 + 5 MHz blocks; hence, bidders may value a contiguous 10 + 10 MHz block at more than twice the value of a single 5 + 5 MHz block. Package bidding would provide the ability to express this value (see Section 7.1). Since no technical concerns were raised, the Department will divide the proposed J block into two 10 MHz blocks (blocks J1 and J2) as shown in Figure 2 and allow package bidding for these two blocks to provide an opportunity for bidders to express their value for the both open bidding blocks. Disaggregating the set-aside block: Some respondents advocated that the proposed 15 + 15 MHz block, GHI, be divided into multiple blocks. New entrants need access to more spectrum to grow their customer bases and offer innovative services. Larger block sizes, as supported by LTE, will allow new entrants to deploy such services more efficiently and improve their customer service. Disaggregating the set-aside block into three 5 + 5 MHz blocks, or into a combination of one 5 + 5 MHz block and one 10 + 10 MHz block, or reducing the amount of spectrum available to new entrants, would undermine such efforts and would not support sustained competition. In light of the above, the Department will maintain the proposed block GHI as one block of 30 MHz. D1 – The band plan shown in Figure 2 below will be adopted for the AWS-3 auction, with the J block subdivided into two separate blocks, namely J1 and J2. Both Canadian and U.S. licensees in the AWS-3 band are subject to conditions of licence crafted to ensure that cross border spectrum sharing arrangements and treaties are implemented. In particular, under the terms of Treaty Series 1962 No. 15 — Coordination and Use of Radio Frequencies — Exchange of Notes between Canada and the United States of America , each country has a legal obligation to protect the other country's previously coordinated stations from potential interference from – and accept any interference that these stations may cause to – new users of this spectrum. Through their conditions of licence, AWS-3 licensees will be required to abide by certain technical requirements and to coordinate with U.S. licensees in accordance with the conditions of any international arrangements or agreements into which Canada enters. U.S. government licensees in the band 1755-1780 MHz: The 1962 Treaty includes incumbent U.S. government licensees in the band 1755-1850 MHz, many of which operate near the Canada-United States border. Although most of these operations will move to other spectrum between now and mid-2020, some systems will remain in the AWS-3 band indefinitely. Since these U.S. government incumbents have been coordinated with Canada, the Department may require Canadian AWS-3 licensees to protect these stations from interference and/or to accept any interference that they may cause as long as they continue to operate in this band. Prior to the auction, licensees are strongly encouraged to consult the NTIA's transition plan and to undertake their own analyses of the potential impacts of U.S. incumbent operations on Canadian operations in the 1755-1780 MHz portion of the AWS-3 band. Industry Canada has provided an analysis in Annex A, but makes no representation or warranties about the accuracy and completeness of this analysis. The document Service Areas for Competitive Licensing outlines the general service areas that are used by Industry Canada for the purposes of issuing spectrum licences. The defined geographic areas have been categorized under "service area tiers" that are based on Statistics Canada's Census Divisions and Subdivisions. As different wireless services and applications are best suited to different sizes of service areas, four tiers of service areas have been established. Tier 1 is a single national service area. Tier 2 consists of 14 large service areas covering all of Canada. There are eight Tier 2 service areas that have provincial/territorial boundaries, and six that are sub-provincial within Ontario and Quebec. Tier 3 contains 59 smaller regional service areas and Tier 4 comprises 172 localized service areas. The population associated with each service area is based on Statistics Canada's census information. In the Consultation, Industry Canada proposed the use of Tier 2 service areas. Larger geographic areas were proposed since they require less coordination between licensees, allow more effective use of radio spectrum, and enable deployment of large-scale networks that can be more efficient due to economies of scale. Tbaytel, Xplornet, ITPA and K-Net proposed the use of smaller Tier 3 areas. Tbaytel indicated it did not support a Tier 2 service area for Northern Ontario because of its vast area and sparse population. Xplornet, IPTA and K-Net argued that the use of Tier 2 areas will prevent smaller players, such as themselves, from bidding, which runs contrary to the goal of making spectrum available for smaller players and is not compatible with business models that focus on providing service in rural areas. ABC Communications proposed the use of Tier 4 service areas to increase the use of the auctioned spectrum and foster competitive regional markets across Canada. MTS, Niagara Networks, PIAC, Québecor, Rogers, SaskTel, TELUS and WIND supported the use of Tier 2 service areas. In its reply comments, PIAC underlined that while it still supports Tier 2 licence areas, the Department should consider whether Tier 3 licensing may be better suited to achieving stated policy objectives as it would allow smaller players to acquire spectrum. Bell proposed that the set-aside spectrum be licensed on a Tier 3 basis, which more closely mirrors an urban-rural split, and that the set-aside only apply to the urban part of the spectrum. Bell suggested that doing so would provide new entrants with immediate access to urban spectrum, which they actually desire and are more likely to deploy in a timely manner. Bell argued that licensing the set-aside spectrum on a Tier 3 basis would make the rural spectrum available to a larger group of potential bidders. Québecor and WIND opposed this proposal indicating that the assumption that they only want to serve urban areas is false and that it would limit deployment along transportation corridors. SaskTel also recommended changes to Tier 2-12 at the Saskatchewan-Alberta border to remove any deviation from the provincial borders for spectrum licences around the City of Lloydminster, proposing that the city should be included in Tier 2-11. TELUS opposed this proposal and noted the arguments provided by Industry Canada in SLPB-001-14, Licensing Framework for Broadband Radio Service (BRS) – 2500 MHz Band , for keeping Lloydminster in Tier 2-12. Similarly, WIND recommended changes to the Eastern Ontario and Outaouais Tier 2 area such that the Outaouais portion of the existing 2-06 licence area should be merged with the Southern Quebec service area 2-05. WIND argued that network design and optimization practices can effectively minimize interference concerns should the boundary be redrawn as proposed. Québecor opposed this, stating that the Ottawa/Outaouais market should be preserved because it is one economic region. Tier size: Licensing spectrum based on larger geographic areas for mobile services generally results in less coordination being required between licensees and more effective use of radio spectrum. However, several commenters argued that licensing spectrum in large tiers does not provide flexibility or opportunity for service providers who want to obtain spectrum in smaller local or regional geographic markets to obtain spectrum corresponding to their business needs. Industry Canada considers the specific technical characteristics of a band to determine the appropriate tier size. For example, given the long-distance propagation inherent in the 700 MHz band, Industry Canada chose to use Tier 2 licences. Based on the propagation characteristics of the 2500 MHz band, the Department concluded that coordination issues would be more manageable than with lower frequency bands and chose to use Tier 3 licences. Given that the AWS-3 band is between the 700 MHz and 2500 MHz bands, propagation is not a decisive consideration, which was also reflected in the decision to offer both Tier 2 and Tier 3 licences for the 2008 AWS-1 auction. The 2008 AWS-1 auction resulted in most of the Tier 3 licences being assigned to the same licensee within each Tier 2 area. Since AWS-1 is adjacent to AWS-3, Tier 2 area licences in AWS-3 will align with the AWS-1 licence areas, which will reduce geographic fragmentation and would enable deployment of large-scale networks, which can be more efficient due to economies of scale. Tier boundaries: The tier service areas were introduced in 1998 following a public consultation that stemmed from the amendments to the Radiocommunication Act , which introduced a new approach to spectrum licensing in 1996. At the time of consultation, there was general agreement among stakeholders regarding the spectrum licensing approach and, to reduce possible interference issues and keep economic areas intact, some deviations were made around provincial borders. The deviations occur in five areas of the country where the use of provincial borders would divide a contiguous economic zone in two. These are comprised of one large population area (Gatineau-Ottawa) and four smaller areas, including the City of Lloydminster, which straddles the border between Saskatchewan (35% of the population) and Alberta (65% of the population). These decisions were based on the population distribution and economic markets in 1998. Industry Canada has seen no evidence that there has been a significant change in population distribution in these areas that would warrant a change in the tier areas. Although some have noted that new technologies help reduce the potential for interference between systems in close proximity, redrawing the tier area boundary to follow the provincial border could still result in increased interference, reduced spectral efficiency and lower quality of service to subscribers. This goes against the principles of the tier areas and of keeping a contiguous economic area intact. Based on the discussion above, Industry Canada will not be changing the boundaries of the tier areas at this time and will license the AWS-3 frequency blocks on a Tier 2 basis (see Annex B). D2 – Tier 2 service areas, as defined by the document Service Areas for Competitive Licensing , will be used to license all frequency blocks for the auction of AWS-3 spectrum licences. Industry Canada anticipates that the AWS-3 spectrum will be highly desirable to wireless service providers and demand is likely to exceed supply for these licences. Consequently, Industry Canada proposed in the Consultation to use an auction process to assign spectrum licences in the AWS-3 band. Auctions are a transparent, fair and efficient spectrum assignment mechanism. When applying competitive measures in the past, Industry Canada has used specific definitions to distinguish between established providers and new entrant providers for the purposes of determining bidding eligibility. In SMSE-002-12, Policy and Technical Framework: Mobile Broadband Services (MBS) — 700 MHz Band, Broadband Radio Service (BRS) — 2500 MHz Band , LWSP are defined as "companies with 10% or more of national wireless subscriber market share, or 20% or more wireless subscriber market share in the province of the relevant licence area." Footnote 7 In the Consultation, the Department proposed that new entrants be defined as service providers that are not LWSP. Industry Canada also proposed that bidding for the spectrum set-aside be limited to new entrants. Industry Canada proposed to limit the eligibility to bid on set-aside spectrum to operating new entrants, since new entrants that are already offering wireless services benefit from an existing network and subscribers, and will be able to add set-aside spectrum to improve their mobile networks. The Department also proposed that the active provision of commercial wireless services, including a minimum coverage within each Tier 2 licence area, would be assessed when determining an applicant's eligibility to bid on the set-aside spectrum. Industry Canada also recognized that AWS-3 spectrum could allow other wireless service providers to enhance their service offerings to Canadians, and proposed that the remaining 20 MHz of spectrum be available for open bidding. There was general support for the use of an auction process to assign spectrum licences in the AWS-3 band and for having spectrum open to all bidders. The majority of respondents did not comment on the definition of LWSP. Niagara Networks supported the definition. PIAC noted that the definition would preclude large regional service providers from bidding on the set-aside spectrum and that it would require these smaller entities to compete with the large national service providers for the spectrum open to all bidders. ABC Communications, Eastlink, K-Net, Niagara Networks, PIAC, Québecor, SSi, Tbaytel and WIND supported the proposal to set aside 30 MHz. MTS had no objection to the proposal. Bell, TELUS and Rogers all indicated that in principle they did not agree with the use of set-asides. As an alternative, TELUS argued that a spectrum cap mechanism would produce fairer spectrum prices. TELUS also proposed that if a set-aside were to be implemented it should be reduced to 20 MHz as it would be less disruptive to the industry as a whole; this proposal was also supported by Bell, Rogers and Xplornet. SaskTel did not support the proposal for set-aside spectrum. WIND urged the Department to reject TELUS's proposal to reduce the amount of set-aside spectrum to 20 MHz from 30 MHz, stressing that new entrants need access to more than one 5 + 5 MHz or 10 + 10 MHz block to effectively deploy LTE offerings. The majority of commenters indicated general support for the proposal to restrict set-aside eligibility to operating new entrants, including Bell, Eastlink, MTS, Québecor, Rogers, SaskTel, TELUS, and WIND. Some noted that the rule would have the effect of limiting the set-aside to those more likely to deploy, and prevent speculative participation. SaskTel argued that the eligibility should also apply to the open bidding block. Stakeholders that proposed an entirely different approach included Xplornet, ABC Communications, K-Net and PIAC. These parties suggested that entirely new market participants should be eligible to bid on the set-aside and given an opportunity to enter the market. Xplornet argued that disallowing new market participants limits the potential for competition, and excludes other types of carriers such as fixed wireless access providers who may be well placed to use AWS-3 spectrum to provide services to Canadians. ABC Communications, PIAC and K-Net similarly argued that rural carriers or other carriers who may be able to serve certain licensing areas are unnecessarily excluded, thereby potentially limiting competition. Niagara Networks suggested that those who are successful in acquiring the set-aside licence be obligated to share it with other competitors. On the subject of the minimum population coverage level, TELUS and Rogers viewed coverage based on 50% of the AWS-1 targets to be a low threshold. Rogers proposed that the coverage requirements be increased to 100% of the AWS-1 targets, arguing that new entrants who acquired set-aside spectrum should meet their full AWS-1 deployment requirements before being eligible to bid on additional set-aside spectrum in the AWS-3 auction. Stakeholders also commented on whether network sharing arrangements between operating new entrants and LWSP should count towards the coverage requirement. WIND proposed that shared networks should not count towards the coverage requirement, noting that doing so would undermine Industry Canada's goals of creating more competition. PIAC supported WIND's position. Québecor submitted that partnerships with LWSP should count towards deployment when assessing eligibility. WIND proposed that the assessment for the active provision of service should include higher thresholds: a retail/distribution network with more than a nominal number of retail locations (i.e. more than 10); and that there should be a "meaningful" level of subscribership in the service area (i.e. more than 1% of the population within the licence area). Both Eastlink and Québecor opposed WIND's proposal. Eastlink argued that WIND's proposal would have a disproportionate impact on rural operating new entrants, and those still in the process of expansion to new areas. Québecor argued that taking into account subscribership is counter-productive, unjust and intrinsically arbitrary. On assessing the subject of active provision of services, Eastlink proposed that subscribership should not be included among the criteria. Eastlink identified hurdles to deployment and technical limitations which operating new entrants have faced that have slowed initial growth in subscribership. Eastlink argued that such limitations do not indicate a lack of commitment to servicing the licence area, indicating that in some areas it has made significant investments in fiber and tower sites to support advanced wireless services in the long term. Bell opposed Eastlink's proposal, arguing that it weakens the operating assessment criteria. Set-aside spectrum: Operating new entrants that are already offering wireless services benefit from an existing network and subscribers, and will be able to add set-aside spectrum to improve their mobile networks. While others advocated for wider access to set-aside spectrum in consultation, Industry Canada notes that licensing AWS-3 spectrum to an operating new entrant that possesses a wireless network is more likely to result in the provision of robust advanced wireless services, allowing for more effective and sustained competition in the post-auction marketplace. Most stakeholders broadly supported Industry Canada's proposal to limit eligibility to bid on the set-aside spectrum to operating new entrants, with some noting that the rule would limit the set-aside to those more likely to deploy, and prevent speculative participation. Industry Canada is of the view that setting aside 30 MHz of AWS-3 spectrum for operating new entrants will support the objectives of sustained competition, robust investment, and timely availability of advanced services. Coverage requirements: Consistent with the approach used in licensing spectrum to operating new entrants, there was also general support for requiring minimum population coverage and the active provision of services. Requiring minimum population coverage based on 50% of the AWS-1 targets was generally well-supported by stakeholders. A network meeting the minimum population coverage would require a substantial investment, and provide an operating new entrant with a strong platform to build upon with set-aside AWS-3 spectrum. At the same time, the required minimum population coverage should take into account that new entrants holding AWS-1 spectrum are now, at most, six years into their 10-year AWS-1 licence terms, leaving another four years to meet 100% of their 10-year deployment targets. Some stakeholders sought clarity as to whether joint or shared networks between new entrants and LWSP would count towards the assessment of minimum population coverage. Coverage provided by a new entrant using its licensed spectrum may count towards the assessment of minimum population coverage in the applicable licence area to determine eligibility to bid on the set-aside spectrum. This coverage can be achieved through different types of network deployments, including stand-alone, shared or joint networks. Assessment of active provision of commercial mobile services: Requiring operating new entrants to demonstrate the active provision of commercial mobile services based on the proposed criteria was also generally well-supported by stakeholders. However, some raised concerns regarding the specific criteria and threshold that would be assessed by Industry Canada. The Department recognizes that the level of activity in the provision of commercial mobile services is multi-faceted and will not define specific criteria. When assessing the eligibility to bid on the set-aside spectrum, Industry Canada will take all of the requested information into account. Given the overall approach and the consideration of alternative proposals, Industry Canada is of the view that the proposed criteria for the assessment of minimum population coverage and active provision of commercial wireless services are appropriate. A similar approach for assessing the active provision of services is used when assessing licence renewal at the end of a licence term and when determining if associated entities are eligible to bid separately in this and other auctions. In each process, Industry Canada examines all aspects that demonstrate the active provision of services. Based on the discussions above, Industry Canada will auction the AWS-3 spectrum with a 30 MHz set-aside for operating new entrants and 20 MHz open to all bidders, as shown in Figure 3. The eligibility will be assessed as outlined below. This figure shows the Canadian band plan for AWS-1 and the spectrum available for auction for AWS-3. AWS-1 is comprised of the bands 1710 to 1755 MHz and 2110 to 2155 MHz and was previously auctioned. AWS-3 is comprised of the bands 1755 to 1780 MHz and 2155 to 2180 MHz. The band plan for AWS-3 includes a set-aside spectrum from 1755 to 1770 MHz and 2155 to 2170 MHz, and open bidding spectrum from 1770 to 1780 MHz and 2170 to 2180 MHz. Two 5 + 5 MHz of paired spectrum (Blocks J1 and J2) will be open to all bidders in every Tier 2 licence area. D4 — LWSP are defined as companies with 10% or more of national wireless subscriber market share, or 20% or more of wireless subscriber market share in the province of the relevant licence area. Footnote 8 New entrants are defined as service providers that are not LWSP. operating a terrestrial wireless network Footnote 9 in the Tier 2 service area, with the minimum population coverage levels shown in Table 2, effective as of the date of application to participate in the AWS-3 auction. D6 — Industry Canada adopts the process for assessing a bidder's eligibility to bid on the set-aside spectrum as outlined in paragraphs 73 to 75 below. Assessing minimum coverage: Industry Canada will assess the deployment level of service against the required coverage level for the tier. Therefore, applicants are required to provide site data and detailed coverage maps based on spectrum licensed to the applicant in the service area with their applications. In addition to reviewing the site data and coverage maps, Industry Canada may verify coverage, through testing, to confirm that wireless services can be accessed throughout the coverage area indicated by the applicant. Applicants should declare where minimum population coverage is met through a joint network, and documentation outlining the partnership, control of the spectrum, and respective contributions towards the joint network should be provided. Industry Canada could also request further documents or other information to verify this or any other information during the application process. the subscribership in each service area (including the level of national subscribership). As stated in the FSAC, Industry Canada's objective is to select an auction design that is optimal for the spectrum being offered and the circumstances that exist at the time. The auction format should be simple, fair and transparent for bidders and lead to an efficient assignment of spectrum. In the selection of an auction format and related rules, consideration is given to the characteristics of the spectrum being auctioned; for example, the quantity and size of the blocks, as well as the similarities and complementarities that may exist among the blocks. In past auctions, Industry Canada has used a simultaneous multiple round ascending (SMRA) auction, a combinatorial clock auction (CCA) or a sealed-bid auction format. A sealed-bid auction requires applicants to submit their bids to the Department in a sealed envelope prior to the receipt deadline for bids in order to apply for each licence. Following the receipt deadline for bids, departmental officials will open the bids, rank them and provisionally award a licence or licences to the highest bidder(s). If the highest bidder for a particular licence is found eligible to be the licensee, that bidder would be awarded the licence. Industry Canada sought comments on its proposal to use a sealed-bid auction format for the AWS-3 auction. In addition, the Department proposed that the AWS-3 auction take place in March 2015, and that the deadline for receipt of applications be January 30, 2015. MTS, Niagara Networks, Québecor, SaskTel, SSi, Tbaytel, WIND and Xplornet all supported the use of a sealed-bid auction format for the AWS-3 auction. Rogers and TELUS proposed changes to the auction format. Rogers recommended that the Department use an SMRA format. TELUS proposed a CCA format. Both TELUS and Rogers argue that the sealed-bid format does not provide for price discovery and that it increases aggregation risk in that bidders may not be successful in assembling the geographic footprint that they require to support their business case. Bell proposed that the Department postpone auctioning the open block for a period of one to two years so that large national and regional wireless service providers can focus capital resources in the near term on the planned deployment of network upgrades and on accommodating their participation in the 2500 MHz auction. SaskTel proposed that Industry Canada wait until after the Canadian Radio-television and Telecommunications Commission (CRTC) ruling on roaming, which SaskTel stated is expected at the end of 2014, before setting the final rules for the auction. As part of their reply comments, SaskTel and PIAC proposed postponing the auction for one to two years. SaskTel supported Bell's proposal for a two-stage auction with an auction for the set-aside block first, followed by an auction for the open block and unsold set-aside blocks if Industry Canada wanted to go ahead with the auction for the set-aside. In their reply comments, WIND reiterated its support for the auction to take place in March 2015 and Rogers opposed postponing the auction. Auction format: When proposing an auction format, Industry Canada considers the benefits of an auction format and the complexity of, and time required, to run the auction. Some respondents proposed that a CCA or an SMRA format should be used for the AWS-3 auction. Although both CCA and SMRA formats provide stakeholders with the benefit of price discovery through the multiple rounds, these formats are more time consuming to implement. However, the decisions for Tier 2 licence areas, a set-aside block and two open bidding blocks means that a simplified auction can be held for this spectrum. Therefore, Industry Canada believes that sealed-bid format is the most appropriate auction format for the AWS-3 auction. Package bidding: Given Industry Canada's decision to divide the open-bidding block in each service area into two blocks, J1 and J2, allowing package bidding for the two open-bidding blocks within a service area would allow bidders to express their value for both blocks in addition to their value for the individual blocks. If bidders were only able to bid on J1 and J2 individually there would be an aggregation risk for bidders that are trying to acquire both blocks. Package bidding will reduce this risk. Therefore, Industry Canada will allow bidders to submit bids for J1 and J2 individually as well as a package bid for both J1 and J2. Auction timing: The Commercial Mobile Spectrum Outlook published in 2013 identified AWS-3 as a band under consideration for commercial mobile services, and noted that AWS-3 could be available for licensing in Canada as early as 2015. Some stakeholders advocated postponing the AWS-3 auction while others supported moving forward with the process, citing a need for more spectrum. Industry Canada is of the view that providers seeking additional spectrum to support investment and expansion of wireless networks would benefit from a timely licensing process, as it will allow them to plan their deployments and provide services to Canadians using the spectrum as soon as possible. To make this spectrum available in a timely manner, Industry Canada will hold the AWS‑3 auction in March 2015, with the deadline for receipt of applications on January 30, 2015. The schedule for the auction process, Table of Key Dates , is available on Industry Canada's Spectrum Management and Telecommunications website at http://www.ic.gc.ca/spectrum. Items and time frames included in the schedule may be updated from time to time. Interested parties are advised to check the website regularly for any updates to the schedule of events. D7 – Industry Canada will proceed with an auction process for AWS-3 in March 2015, with the deadline for the receipt of applications on January 30, 2015. D8 – Industry Canada will use a sealed-bid auction format for the AWS-3 auction and will allow package bids for the open-bidding blocks within each Tier 2 area. Further information on the determination of provisional licence winners can be found in Section 10.9. Industry Canada sought comments on the proposal to use a second-price rule to determine the price that winning bidders would be required to pay. A second-price rule requires winning bidders to pay an amount that is sufficient to ensure that no other bidder, or group of bidders, is prepared to pay more for the licence(s) in question. ABC Communications, Bell, Eastlink, MTS Allstream, Niagara Networks, PIAC, Québecor, SaskTel, SSi, Tbaytel, TELUS and WIND supported the proposal to use a second-price rule. Xplornet stated that it opposed the second-price rule and suggested that winning bidders pay the full amount of their bid. Rogers stated that it does not support the use of a second-price rule combined with a sealed-bid format because it believes that with this combination, along with the relatively low opening bids and eligibility limits, there will be limited bidding on the set-aside spectrum in every geographic area. A second-price rule requires each winning bidder to pay an amount that is sufficient to ensure that no other bidder, or group of bidders, is prepared to pay more than the winning bidder for the licence(s) in question. Industry Canada proposed a second-price rule since it promotes a more efficient outcome by increasing the incentive for bidders to bid in a way that is consistent with how they truly value the licences. Bidders, knowing that they will only be required to pay the amount determined by the second-price rule, will have a greater incentive to bid truthfully. This promotes an efficient auction outcome. Given the decisions to have two open-bidding blocks and to allow bidders to submit a package bid for the two open-bidding blocks within a service area, the price(s) for the open bidding blocks could depend on package bids and/or bids for the individual licences. With package bidding, in some cases, the second price may not be high enough to ensure that there is no alternative bidder or group of bidders prepared to pay more for the licences in question. To address this, Industry Canada could require an additional payment above the second price to ensure that the winning bidder(s) pay an amount that is sufficient to ensure that no other bidder or group of bidders is prepared to pay more for the licence(s) in question. 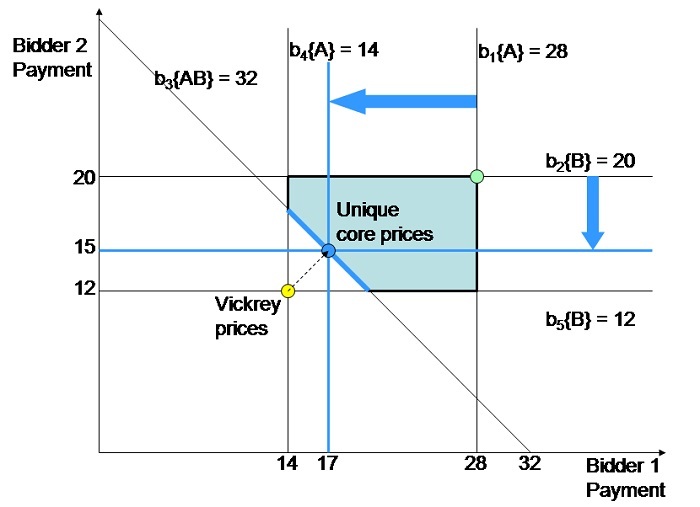 More specifically, Industry Canada could apply bidder-optimal core prices and use the "nearest Vickrey" approach (see Annex C). This approach was used to determine prices for the recent 700 MHz auction and will be used in the forthcoming 2500 MHz auction. D9 – Industry Canada will implement a second-price rule, including bidder-optimal core prices and use of the "nearest Vickrey" approach. Prices for the open-bidding blocks and the set-aside block in each service area will be determined separately. Further information on the determination of prices can be found in Annex C.
For a sealed-bid auction, opening bids are the minimum amount that will be accepted for each licence. Industry Canada proposed opening bid prices for the AWS-3 spectrum auction that are comparable to the opening bid prices for the forthcoming 2500 MHz auction. Eastlink, PIAC, Québecor, SaskTel, SSi, and WIND supported the proposed opening bids. MTS, TELUS and Xplornet did not object to the proposed opening bids. However, TELUS noted the proposed opening bids are low compared to the opening bid prices being used in the U.S. AWS-3 auction. Bell agreed with the proposed opening bids but recommended that in the event that there is only one bidder for the set-aside licence in a particular service area, the amount paid for the licence should be equivalent to the present value of the foregone annual licence fees ($0.035/MHz/pop) over the 20-year term of the licence. These prices would be approximately 3 times higher than proposed in the Consultation. Eastlink, Québecor and WIND opposed Bell's proposal. Xplornet agreed with the proposed opening bids in the range of $0.05 to $0.14 per MHz/pop but it questioned why the opening bid is lower in Toronto in comparison to Montreal and lower in Saskatchewan in comparison to Manitoba and Alberta. It stated that such differences are not justified by the demand for spectrum in the respective areas. Rogers considered the level of the proposed opening bids too low. It noted that the proposed opening bids are lower than the U.S. reserve bids for the AWS-3 spectrum. Rogers also pointed out that the proposed opening bids are lower than the opening bids in the AWS-1 auction. It suggested that opening bids for the set-aside spectrum should be set at the average price of winning bids in the AWS-1 auction, which it calculated as being approximately 12 times higher than the proposed AWS-3 opening bids. Rogers argued that for most service areas, there would be only one eligible bidder for the set-aside spectrum; therefore, the AWS-1 results could serve as a proxy for the market value for this spectrum. As with all opening bids in recent Canadian spectrum auctions, those proposed in the Consultation were set on the conservative side to reduce the risk of discouraging participation from bidders with viable business plans. The determination of the proposed opening bids took into consideration transactions for 2500 MHz spectrum licences in the Canadian wireless market and the Canadian 2008 AWS-1 auction results. The proposed bids were similar to those that will be used in the upcoming 2500 MHz auction since the AWS-3 and 2500 MHz bands are comparable in a number of ways. They both have similar propagation characteristics and recognition as commercial mobile frequencies. An equipment ecosystem is not expected to be available for the AWS-3 band for two to three years, and the 2500 MHz band also lacks a well-established device ecosystem. Also, in the case of AWS-3, there will be delays in the usability of this spectrum in certain areas due to temporary or permanent incumbent users in the United States. Having considered the comments received, Industry Canada has decided that the opening bid prices should be as proposed in the Consultation as they are considered to reflect a conservative estimate of the market value of the spectrum in each service area, and are set high enough so that Canadians will receive a fair return for the use of the spectrum but not so high as to discourage participation in the auction. D10 – The opening bids for the AWS-3 auction are listed in Table 3. The total amount of the proposed opening bids for all spectrum blocks is $162,450,000. In order to maintain auction integrity, as in past auctions, Industry Canada proposed that there be rules relating to the participation of affiliated and associated entities in order to ensure that each bidder is an independent bidder. The Department proposed a definition of affiliated entities and that affiliated entities not be allowed to participate separately in the auction. As in previous auctions, applicants will be required to disclose information about their companies, including affiliations and associations. Eastlink, K-Net, Niagara Networks, PIAC, Québecor, SaskTel, SSi, Tbaytel, TELUS and WIND indicated that they supported the proposed definition of affiliated entities. MTS indicated that it had no objection to the definition. Given that the proposed definition for affiliated entities is consistent with other auction processes and that there were no comments proposing changes, the definition will be as proposed in the Consultation. Furthermore, there were no comments regarding the presumption of affiliate status or bidding eligibility for affiliated entities; therefore, these rules will apply as set out below. D11 — Industry Canada adopts the definition and the bidding eligibility for affiliated entities as outlined in paragraphs 105 to 110 below. Affiliated Entities (definition): An entity will be deemed to be affiliated with a bidder if it controls the bidder, is controlled by the bidder, or is controlled by any other entity that controls the bidder. "Control" means the ongoing power or ability, whether exercised or not, to determine or decide the strategic decision-making activities of an entity, or to manage or run its day-to-day operations. Presumption of Affiliate Status: If a person owns, directly or indirectly, at least 20% of the entity's voting shares (or where the entity is not a corporation, at least 20% of the beneficial ownership in such entity), Industry Canada will generally presume that the person can exercise a degree of control over the entity to establish a relation of affiliation. The ability to exercise control may also be demonstrated by other evidence. Under this rule, Industry Canada may, at any time, ask a prospective bidder for information in order to satisfy any question of affiliation. Applicants may provide information to Industry Canada to rebut the presumption of affiliate status. Applicants must notify the Department in writing if they are rebutting the presumption and must file material that will enable Industry Canada to review the question and make that determination. It is the responsibility of the applicant to file the appropriate material. Such material may include: copies of the relevant corporate documentation relating to both entities; a description of their relationship; copies of any agreements and arrangements between the entities; and affidavits or declarations, signed by officers from the two entities, dealing with the control as outlined in the definition of "affiliate" above. Upon receipt of this material, Industry Canada will either make a ruling based on the materials submitted or ask the applicant for further information and provide a timeline within which to do so. Bidding eligibility for affiliated entities: Only one member of an affiliate relationship will be permitted to become a qualified bidder in the auction or the affiliated entities may apply to participate jointly as a single bidder. Affiliated entities must decide prior to the application deadline which entity will apply to participate in the auction. All affiliations must be disclosed at the time of the application. In the cases where the entities participating jointly include an LWSP, the LWSP's eligibility to bid on set-aside spectrum would apply to all of the entities. In support of the stated policy objectives regarding competition and investment, and in light of the high demand for capacity (driven by the use of smart phones and tablets), the high cost of network deployment, particularly in rural areas, as well as the spectrum and network efficiencies that can be achieved through such arrangements, Industry Canada recognizes the need to provide increased flexibility in the treatment of a certain subset of associated entities, as long as this would not have an adverse impact on the integrity of the auction. Industry Canada sought comments on a proposed definition of associated entities and proposed rules that would allow carriers to form a bidding consortium and to participate in the auction as a single bidder if they wish to coordinate their bids through a single bidder. Industry Canada also proposed that associated entities only be allowed to participate separately if, following a review of their application, Industry Canada is satisfied that their participation would not have an adverse impact on auction integrity. The Department further proposed that for associated entities participating jointly, the eligibility rules would apply jointly in each licence area, and in cases where the entities participating jointly include an LWSP, the LWSP's eligibility to bid on set-aside spectrum would apply to all of the entities bidding jointly with the LWSP. Eastlink, K-Net, Niagara Networks, PIAC, Québecor, SaskTel, SSi, Tbaytel, TELUS and WIND indicated that they supported the proposed definition for associated entities. MTS indicated it they had no objection to the definition. Rogers proposed that the rules regarding associated entities be clarified so that prospective bidders are able to understand the extent to which their relationship with other bidders will or will not impact eligibility to bid for set-aside spectrum. Given that the proposed definition for associated entities is consistent with other auction processes and that there were no comments proposing specific changes, the definition will be as proposed in the Consultation. In addition, allowing associated entities to apply to bid separately in the AWS-3 auction would not have an adverse impact on the integrity of the auction given the rules in place to maintain the integrity of the auction. Therefore, as proposed, Industry Canada will allow associated entities to apply to bid separately in the AWS-3 auction. In the paragraphs below, the Department has also provided further clarification regarding associated entities' ability to bid on the set-aside spectrum. D12 – Industry Canada adopts the definition and the process for associated entities to apply to bid separately in the AWS-3 auction as outlined in paragraphs 115 to 124 below. Associated entities (definition): Any entities that enter into any partnerships, joint ventures, agreements to merge, consortia or any arrangements, agreements or understandings of any kind, either explicit or implicit, relating to the acquisition or use of any spectrum in the AWS-3 band, will be treated as associated entities. Typical roaming and tower sharing agreements would not cause entities to be deemed associated. Eligibility for associated entities to participate separately in the auction: Associated entities participating in this licensing process may apply to bid separately in the AWS-3 auction. Industry Canada is of the view that allowing associated entities that are competitors in the market to bid separately would not have an adverse impact on the integrity of the auction provided that auction participants comply with the information disclosure and anti-collusion rules discussed below (Section 8.3 — Prohibition of Collusion and Section 8.4 — Auction Integrity and Transparency). To obtain approval to participate separately in the auction, entities will be required to demonstrate to Industry Canada's satisfaction that they intend to separately and actively provide services in the applicable licence area. Associated entities wishing to participate in the auction separately would be required to submit their application at least two weeks in advance of the final application deadline. This requirement would provide Industry Canada with the additional time necessary to assess the nature of the association between the entities. Should the request be denied, only one of the associated entities will be eligible to apply to participate in the auction. Industry Canada's review will not extend to an overall assessment of the effects of the agreement between associated entities on competition in the marketplace. the companies' demonstration of separate presences in the marketplace. business and financial results, including investments and customer acquisition. Industry Canada may request additional documentation to complete its assessment and may require that documents be certified by an officer of the company. All entities participating in the auction will be subject to the same prohibition of collusion rules, as stated below in Section 8.3. Associated entities' ability to bid on the set-aside spectrum: In cases where the associated entities participating jointly include an LWSP, the LWSP's eligibility to bid on set-aside spectrum would apply to all of the entities in each service area. For associated entities that are approved to bid separately in the auction, the eligibility to bid on set-aside spectrum would apply separately in each service area. In the Consultation, Industry Canada proposed the same prohibition of collusion rules as those for the 2500 MHz auction. Eastlink, K-Net, PIAC, Québecor, SaskTel, SSi, TELUS, WIND and Xplornet supported the proposed prohibition-of-collusion rules. MTS indicated that it had no objection to the definition. Rogers suggested that the rules prohibiting collusion should be strengthened and clarified. Given that the proposed prohibition of collusion rules are consistent with other auction processes and that there were no comments proposing specific changes, the definition will remain as proposed in the Consultation. Prospective bidders will note that the auction application forms contain a declaration that the applicant will be required to sign certifying that the applicant has not entered into and will not enter into any agreements or arrangements of any kind with any competitor regarding the amount to be bid, bidding strategies or the particular licence(s) on which the applicant or competitors will or will not bid. For the purposes of this certification, "competitor" means any entity, other than the applicant or its affiliates, which could potentially be a bidder in this auction based on its qualifications, abilities or experience. Prospective bidders should note that the definition of "affiliate" for the purposes of this licensing process (defined by reference to "control in fact") differs from "affiliate" for the purposes of the Competition Act. The provisions of the Competition Act apply independently of, and in addition to, the policies contained in this Framework. The Consultation proposed that the following requirements and procedures be implemented regarding affiliated and associated disclosure, different types of communications and discussions between bidders, and the use of consulting services by bidders in order to ensure the integrity and transparency of the AWS-3 auction. There were no comments regarding the requirements and procedures that Industry Canada proposed to maintain the integrity and transparency of the auction. Given that there were no comments and that these requirements and procedures are the same as those for the forthcoming 2500 MHz auction, Industry Canada will impose the measures proposed in the Consultation to maintain the integrity and transparency of the AWS-3 auction. D14 – In order to protect the integrity of the auction, Industry Canada adopts the rules regarding affiliated and associated disclosure, different types of communications and discussions between bidders, and the use of consulting services by bidders as outlined in paragraphs below. Affiliated and associated entity disclosure requirements: All entities wishing to participate in the auction process will be required to disclose in writing, as part of their application, the names of affiliated and associated entities. A narrative must also be submitted, describing all key elements and the nature of the affiliation or association in relation to the acquisition of the spectrum licences being auctioned and the post-auction relationships of the said entities. This narrative must include arrangements with another potential bidder that relate in any way to the future use of the AWS-3 spectrum directly or indirectly. Some examples of arrangements that would require disclosure include, but are not limited to, agreements to establish a joint network using spectrum licences acquired by each of the entities and agreements with respect to a joint backhaul network. Agreements, such as significant joint equipment purchases must also be disclosed. Typical roaming and tower sharing agreements and other agreements, such as the purchase of backhaul capacity, would not cause entities to be deemed associated entities and hence need not be disclosed. The submitted narrative will be made available to other bidders and to the public on Industry Canada's website prior to the auction in order to ensure transparency of the licensing process. Communications: Any communications from an applicant, its affiliates, associates or beneficial owners or their representatives that discloses or comments on bidding strategies, including but not limited to the intent of bidding and post-auction market structures, shall be considered contrary to this Framework and may result in disqualification and/or forfeiture penalties. Statements that indicate national or particular licence areas of interest will generally be found to be in contravention of the rules on prohibition of collusion. This will include communications with or via the media. This prohibition of communication applies until the public announcement of provisional licence winners by Industry Canada. Once a consortium has been established and if the entities within that consortium have had communications that contravene the anti-collusion rules, these entities would no longer be eligible to participate separately in the auction. The same entities would therefore no longer be deemed competitors for the purpose of the auction, and discussions regarding issues such as bidding strategies could then take place. Should the consortium be dissolved prior to the auction, only one of the entities would be eligible to participate in the auction, and all parties would continue to be subject to the prohibition of collusion rules. The same restrictions apply to entities that have had unsuccessful discussions regarding the formation of a consortium to bid as a single bidder. Where communications that fall within the definition of associated entities have taken place, the nature of the association must be disclosed. Entities applying to participate separately are required to make a declaration that they have not entered into and will not enter into any agreements or arrangements of any kind with any competitor regarding the amount to be bid, bidding strategies or the particular licence(s) on which the applicant or competitor will or will not bid. In the case where discussions that contravene the prohibition of collusion rules have occurred, the entities would only be permitted to participate in the auction as one single bidder, or only one of the entities could participate. Discussion regarding beneficial ownership: Information regarding the beneficial ownership of each applicant will be made publicly available so that all bidders have knowledge of the identity of other bidders. Any discussions involving two bidders or any of their affiliates or associates regarding an addition or a significant change of beneficial ownership of a bidder, from the receipt deadline for applications until the public announcement of provisional licence winners by Industry Canada, would fall into the area of prohibited discussions and would be considered contrary to the auction rules. the applicant informs the Minister of Industry immediately in writing of any change in beneficial ownership, which will be reflected in its published qualified bidder information on Industry Canada's Spectrum Management and Telecommunications website (http://www.ic.gc.ca/spectrum). Bidders must cease all such negotiations at least 10 days before the sealed bid deadline until the public announcement of provisional licence winners by Industry Canada. Discussions on tower sharing: The prohibition of communication includes discussions about tower and site sharing with respect to the licences that are the subject of this auction until the receipt deadline for payment of winning bids. Discussions concerning new arrangements or the expansion of existing sharing arrangements that relate to spectrum outside of the AWS-3 auction process are not prohibited. Communication with Local Exchange Carriers: The prohibition of communication includes discussions regarding interconnection services with a local exchange carrier (LEC) that is a qualified bidder (or one of its affiliates/associates) in this auction, where the services relate to spectrum in the AWS-3 band. Consulting Services, Legal and Regulatory Advice: Separate bidders may not receive consulting advice from the same auction consulting company. Separate bidders may receive legal and regulatory advice from the same law firm provided that the law firm complies with the conflict of interest and confidential information requirements of the applicable law society and that the applicants otherwise comply with the provisions set forth in this document. Industry Canada sought comments on the standard conditions of licence that would apply to licences issued through the auction process for spectrum in the AWS-3 band. The FSAC, states that Industry Canada has adopted a flexible approach in determining licence terms (up to 20 years) based on the specific spectrum being offered and subject to a public consultation preceding the specific auction or renewal process. The AWS-3 band has the potential to facilitate the offering of high-capacity mobile broadband services to Canadians. Given that the use of this band for mobile services is globally harmonized, there is little risk that there will be any usage changes to or developments in technology that would result in a change that is incompatible with mobile services. In light of the above, Industry Canada proposed that auctioned spectrum licences in the AWS-3 band have a licence term of 20 years. Bell, Eastlink, K-Net, Niagara Networks, PIAC, MTS, Québecor, Rogers, SaskTel, Tbaytel, TELUS and WIND all supported the proposed 20-year licence term. ABC Communications would prefer a 10-year licence term, with a 10-year renewal term that is contingent upon meeting the deployment requirements, since this provides business certainty required to support a substantial investment into the construction of a network. Xplornet said it can appreciate that the certainty of a 20-year licence term would allow potential new entrants to make significant investment decisions with confidence; however, licences should be for a shorter term of 10 years due to the rapid change in technology and its implications. McNally et.al. suggested that 20 years is too long a time for valuable spectrum to be reserved for private exclusive use, with little chance of reappraisal of the public value. They mentioned that the FCC has planned for 12-year licence terms. In the reply comments, McNally supported ABC Communications and Xplornet. The majority of respondents were supportive of the proposed 20-year licence term. Industry Canada remains of the view that the AWS-3 band has the potential to support high-capacity mobile broadband services for Canadians and there is little risk that there will be any usage changes to, or developments in, technology that would result in a change that is incompatible with mobile services. Therefore, the licence term for the AWS-3 licences will be 20 years. The term of this licence is 20 years. At the end of this term, the licensee will have a high expectation that a new licence will be issued for a subsequent term through a renewal process, unless a breach of licence condition has occurred, a fundamental reallocation of spectrum to a new service is required, or an overriding policy need arises. The process for issuing licences after this term and any issues relating to renewal, including the terms and conditions of the new licence, will be determined by the Minister of Industry following a public consultation. Commercial mobile spectrum is an important resource to be managed for the economic and social benefit of Canadians. In general, spectrum licences may be transferred in whole or in part (either in geographic area or in bandwidth) subject to the approval of the Minister. All commercial mobile spectrum licence transfer requests are subject to review under the Framework Relating to Transfers, Divisions and Subordinate Licensing of Spectrum Licences of Commercial Mobile Spectrum , (the Transfer Framework) Footnote 10 as provided for in the proposed condition of licence below. As the AWS-3 band is commercial mobile spectrum, the Transfer Framework will apply to these licences. As noted in the policy objectives described in Section 2 and in the Consultation, Industry Canada views the licensing of AWS-3 spectrum as a key opportunity to support competition and to enable new entrants to improve their wireless networks. Industry Canada proposed wording for the condition of licence on transferability and divisibility consistent with the Transfer Framework and with other commercial mobile licences. ABC Communications, Eastlink, K-Net, MTS, Niagara Networks, PIAC, SSi, Tbaytel, and WIND supported Industry Canada's wording for the condition of licence on transferability and divisibility. Rogers does not support the current licence transfer regime since it believes that Industry Canada should eliminate restrictions on the transfer of mobile spectrum licences in the secondary market, that the Department's spectrum licence transfer policy might prevent mobile spectrum from being put to its highest use, and that Canadians will be better served by the unrestricted transfer of mobile spectrum. Bell agreed with Rogers' concerns with the current licence transfer regime, arguing that that there is a degree of uncertainty due to the fact that any transfer might not be permitted, and requested that Industry Canada confer the maximum amount of certainty and predictability into its review processes. Since the AWS-3 band is commercial mobile spectrum, the Transfer Framework will apply to these licences. The wording will be maintained as proposed in the Consultation, as shown below. This licence is transferable in whole or in part (divisibility), in both bandwidth and geographic dimensions, subject to Industry Canada's approval. A Subordinate Licence may also be issued with regard to this licence. Industry Canada's approval is required for each proposed Subordinate Licence. The licensee must make the Transfer Request in writing to Industry Canada. The Transfer Request will be treated as set out in Client Procedures Circular CPC-2-1-23, Licensing Procedure for Spectrum Licences for Terrestrial Services , as amended from time to time. The licensee must apply in writing to Industry Canada for approval prior to implementing any Deemed Transfer, which will be treated as set out in CPC-2-1-23. The implementation of a Deemed Transfer without the prior approval of Industry Canada will be considered a breach of this condition of licence. Should the licensee enter into any Agreement that provides for a Prospective Transfer with another holder of a Licence for commercial mobile spectrum (including any Affiliate, agent or representative of the other licence holder), it must apply in writing to Industry Canada for review of the Prospective Transfer within 15 days of entering into the Agreement, which will be treated as set out in CPC-2-1-23. Should Industry Canada issue a decision indicating that the Prospective Transfer is not approved; it will be a breach of this condition of licence for a licensee to remain in an Agreement that provides for the Prospective Transfer for a period of more than 90 days from the date of the decision. In all cases, the licensee must follow the procedures as outlined in CPC-2-1-23. All capitalized terms have the meaning ascribed to them in CPC-2-1-23. The objective of a deployment requirement is to ensure that the AWS-3 spectrum is deployed in a timely manner. Such a condition will serve to deter the acquisition of spectrum licences by speculators and those whose intent is to prevent access to the spectrum by their competitors. Similar conditions of licence have been applied to previously auctioned spectrum licences. In the 2008 AWS auction, levels of deployment were set for each licence area based on the population of the major urban centres for that particular licence area for Tier 2 and Tier 3 service areas. These levels were also set out for the general deployment requirements for the 700 MHz and 2500 MHz auctions. The Department proposed a 5-year deployment requirement based on the Tier 2 service area using the AWS-1 Tier 2 population coverage levels to encourage use of the spectrum in a timely manner. The Department also proposed a 10-year deployment requirement such that in each Tier 2 licence area licensees would be required to meet the equivalent AWS-1 Tier 3 population coverage levels to encourage deployment to additional communities. Industry Canada further proposed that where a licence is transferred during the initial 10 years, the requirement for the new licensee to deploy will continue to be based on the initial licence issuance date. WIND, SSi, Eastlink, MTS, Telus and Niagara Network supported the proposed deployment requirements. Rogers supported the proposed use of 5-year, Tier 2 deployment requirements for the open bidding block but suggested that the set-aside should have tougher deployment targets. Tbaytel said that it finds the Tier 2 deployment requirements high for regional service providers to meet in low population areas and that the proposed levels will be a significant challenge; however, the company believes that it will be able to meet the proposed levels, even at the Tier 3 level. K-Net and Québecor suggested that the requirements will be difficult to meet. K-Net notes that although the company serves a large percentage of the geography of Northern Ontario, it currently only serves 7% of the population. Québecor states that the timelines should be pushed back due to the possibility of equipment not being available. McNally et.al., PIAC, SaskTel, Xplornet and Bell all suggested that the proposed deployment requirements are inadequate. They all suggested different ways to increase the levels. PIAC indicated that the minimum population levels for the 10-year deployment requirement should be increased by 2.0 times in urban areas, and 1.5 times in non-urban areas. Xplornet proposed that the first deployment requirements be at least 60% of the population at year 3 or 4, and 90% or more by year 7. SaskTel proposed that Industry Canada require that every major city centre with a population of more than 10,000 within each Tier 3 service area be covered within the first 10 years. Deployment requirements have been used in previous licensing processes to encourage the delivery of service in a timely manner. The recommendations for deployment proposed in the Consultation recognize Industry Canada's objective of ensuring that the spectrum be used for the economic and social benefit of Canadians. However, several respondents raised concerns regarding the timelines and the levels proposed. Given the time required to clear incumbents from the AWS-3 band in the U.S. and the ongoing complexities of deploying within the band, the FCC has taken the exceptional approach of awarding licences for terms that are from 2 to 5 years longer than its typical licence term (depending on the impact on licensees) and has established interim deployment deadlines between years 6 and 9. The Department similarly recognizes the unique circumstances in the AWS-3 band that could delay the development and availability of a suitable ecosystem for AWS 3 in Canada. Industry Canada is of the view that this combination of factors could make deployment to the proposed 5-year targets infeasible. In recognition of these uniquely challenging circumstances, Industry Canada will not adopt the proposed 5-year, Tier 2 deployment requirement. However, the Department is still of the view that Canadians would benefit from a rapid and wide deployment, and that strong deployment requirements are appropriate given the growing demand for mobile data services across the country and the high value placed on spectrum resources. Absent the requirement to deploy within 5 years, Industry Canada will adopt a deployment requirement such that in each Tier 2 licence area, licensees will be required to meet the Tier 3 population coverage levels shown in Annex E at 8 years, rather than the 10 years proposed in the Consultation. Such a timeline responds to stakeholder concerns by providing licensees with more time and greater flexibility to deal with ecosystem delays, while ensuring timely deployment across Canada. Several stakeholders also argued that the proposed deployment requirements could be modified to better support the Department's objective to see the benefits of the spectrum made available to Canadians across the country, including those in rural areas, in a timely fashion. Industry Canada considered the various proposals and has determined that an increase of 10% to the AWS-1 Tier 3 coverage levels in each service area will expedite deployment beyond large and medium population centres, resulting in more timely access to advanced wireless services in more rural areas and small communities. Compared to the proposed 10-year deployment requirements, in low population density tiers, the 10% increase will result in 1.5 to 2 times the population having access to AWS-3 services. In tiers with higher density populations, the 10% increase will require AWS-3 licensees to deploy beyond the urban core or to more communities within the tier. Overall, the 10% increase in minimum population requirement will result in service to more than three million more Canadians two years earlier than what was initially proposed. In consideration of the above, the condition of licence for deployment is as shown below. Licensees will be required to demonstrate to the Minister of Industry that this spectrum has been put to use as specified in Annex E of this Framework within eight years of the initial issuance of the licence. When the spectrum is put to use, it shall be used to provide services predominantly to Canadians within the service area. Where a licence is transferred during the initial eight years of the licence term, the requirement for the new licensee to deploy will continue to be based on the initial licence issuance date. The Department also sought comments on the overall conditions of licence that would apply to the AWS-3 licences as proposed in Annex B of the Consultation. Only TELUS submitted comments regarding the conditions of licence which were proposed in Annex B of the Consultation. TELUS proposed changes to the condition of licence regarding Research and Development (R&D), suggesting that it is antiquated and no longer necessary and proposed that it be removed. In February 2014, Industry Canada released a decision modifying the condition of licence requiring licensees to invest a portion of their adjusted gross revenues in research and development (R&D) activities, as published in SLPB-002-14, Decisions on Conditions of Licence Regarding Research and Development and Learning Plans . This revised condition of licence applies to all existing spectrum and satellite licences that are currently subject to the R&D condition of licence and as such, it will apply to the new spectrum licences in the AWS-3 band. D18 – Spectrum licences which are assigned as a result of the AWS-3 auction will be issued with the conditions of licence described in Annex D.
Industry Canada sought comments on the proposed general process for submitting an application to participate in the AWS-3 auction, as well as the proposed general requirements and rules that apply prior to, during and post-auction. Eastlink, K-Net, Québecor, SaskTel, Tbaytel, and WIND supported the proposed auction process without additional comments. MTS had no objection to the auction process and no additional comments. Rogers supported the proposed auction process, but suggested that a question and answer session could be added as well as a date for final auction policy publication and final publication of results. Rogers submitted that publication of the final results will be required 30 days or no less than two weeks in advance of the 2500 MHz auction so that prospective bidders in the 2500 MHz auction will be able to finalize their valuations and bidding strategies. Bell supported the proposed auction process, but agreed with Rogers that certain events and milestones should be included. These included a clarification phase, a date by which the Department will publish the final auction policy, and the date the final results of the auction will be published. Bell is also in agreement with Rogers that the timing of the release of the final results is important given the timeframe between the AWS-3 and 2500 MHz auctions. SSi supported the auction process, but indicated that the possibility of delays could tie up deposits for an extended period. They suggested a lower deposit amount, such as one-third of what is proposed in the consultation. Xplornet supported the proposed auction process; however, the company expressed concerns that participants must make independent decisions about the 2500 MHz auction without considering the outcome of the AWS-3 auction and indicated that smaller participants may only be able to commit to one auction process, and if they are unsuccessful, may not be able to participate in the other auction. Additional timing information on key milestones and important dates are detailed on the Table of Key Dates released at the same time as this decision. Section 17 addresses the process for submitting clarification questions. D19 – The following subsections 10.1 to 10.9 outline the process for the AWS-3 auction. To participate in the auction, all applicants must submit the completed application forms, along with the financial deposit, details of the applicant's beneficial ownership, information on any affiliations and associations as discussed in Section 8 of this document, information on the eligibility to bid on the set-aside spectrum licences in each tier, and other documentation as required, by the date specified. Industry Canada will publish the list of applicants on its website soon thereafter, and other documentation as required, by the date specified on the Table of Key Dates . The application forms for participation will be available on request by sending an email to: ic.spectrumauctions-encheresduspectre.ic@canada.ca. Additional documentation may be required in support of the application forms. In the interest of providing Industry Canada and other bidders with adequate information on the identity of all bidders, applicants are required to fully disclose the beneficial ownership for every entity that owns, directly or indirectly, 10% or more of the applicant’s voting shares, non-voting shares, partnership interests, or any other beneficial interests, as the case may be. Associated entities wishing to participate separately in the AWS-3 auction are required to disclose the names of their associated entities within their application, and to provide narratives describing all key elements and the nature of the association in relation to the acquisition of the spectrum licences being auctioned and the post-auction relationships of the said entities. A list of applicants, their beneficial ownership information, affiliated entities and the narrative on any associated entity relationships will be made available on Industry Canada’s Spectrum Management and Telecommunications website, prior to the auction, so that all bidders have knowledge of the identity of the other bidders. Applicants are not permitted to change their beneficial ownership within 10 days preceding the deadline for sealed bids. Applicants should also include any other information considered relevant to support eligibility. Industry Canada may request additional documentation. The application forms, the associated documents (as per the instructions on the application forms) and the total pre-auction financial deposit are to be physically delivered to the Manager, Auction Operations, by the date specified. Industry Canada, under exceptional circumstances, may decide to accept additional documentation after the deadline, but prior to publication of the list of applicants, on request of the proposed applicant. Applications that are received without a deposit will be rejected. Upon receipt of the application and the associated documentation, Industry Canada will send a notification to the applicant, advising that the application materials have been received and confirming the amount of the deposit that has been submitted. This notice will in no way mean that the application materials or the deposit have been approved. The financial deposit must be in the form of a certified cheque, bank draft, money order, wire transfer, or an irrevocable standby letter of credit, payable to the Receiver General for Canada, drawn on a financial institution that is a member of the Canadian Payments Association. The elements required in a letter of credit, as well as a sample letter of credit acceptable to Industry Canada, will be provided as part of the application forms. Multiple letters of credit (or other forms of payment) from one or more financial institutions will be permitted within reason. Industry Canada will treat the financial deposit for an applicant as being the sum of the amounts of each accepted letter of credit. Each letter of credit must comply with the following conditions, which will be detailed in the application package. No letter of credit shall have any conditions requiring Industry Canada to draw on the letters in any particular order of priority, or requiring any letter to be drawn upon completely before drawing upon any other letter. In the event that a qualified bidder does not become a provisional licence winner, the financial deposits that were submitted in the form of a letter of credit will be returned. Refunds to deposits submitted in the form of a certified cheque, bank draft, money order or wire transfer will likely take longer (perhaps several weeks longer) than a refund submitted by way of a letter of credit, as a cheque from the Receiver General for Canada will need to be processed. Upon receipt of an amended form(s) and/or financial deposit, Industry Canada will send a notification to the applicant that the amended form(s) and/or deposit have been received. The notification will state the amount of the new deposit that has been submitted. Where the financial deposit is in the form of an irrevocable standby letter of credit, the initial irrevocable standby letter of credit will also be returned to the applicant where applicable. Where the financial deposit is in a form other than an irrevocable standby letter of credit, any partial reimbursement of the financial deposit may take several weeks. A list of all applicants will be made public via Industry Canada’s Spectrum Management and Telecommunications website (http://www.ic.gc.ca/spectrum). The publication of this list in no way means that these applicants have been approved as qualified bidders. Industry Canada will review the application forms (and any associated documents) and the accompanying financial deposit after the closing date for the submission of applications. Applications that are received without a deposit by the application deadline will be rejected. In this initial review, the Department will identify any errors in the application forms or financial deposit. It will also determine whether any additional information related to any affiliate or associated entity of the applicant, or to the qualifications to bid on set-aside spectrum in certain licence areas, is required. Following the initial review period, Industry Canada will provide applicants with an opportunity to correct any errors or inconsistencies in their application or financial deposit, and will request any additional information related to affiliated or associated entities, and eligibility for the set aside spectrum, if required. A copy of the original applications may be returned to the applicant with a brief statement outlining any discrepancies and/or omissions, or requesting additional information. The applicant will be invited, in writing, to resubmit the corrected form and/or the additional information and to physically deliver this to the Manager, Auction Operations, by the date specified in the written statement. Those applicants that have submitted acceptable application materials, including the accompanying financial deposit, will receive a letter confirming that they are considered a qualified bidder. In addition, those applicants who have submitted material related to eligibility to bid on set-aside spectrum will be advised on their eligibility in each applicable licence area. A list of all qualified bidders, along with information related to their beneficial ownership, affiliates and associated entities, will be made public via Industry Canada’s website. Applicants wishing to withdraw their application materials and have their financial deposits returned may do so, without prejudice, by sending a written request to the Manager, Auction Operations, on or before the business day preceding the receipt deadline for sealed bid. The Auction Authorized Representative is the individual nominated by the applicant to receive and submit all documentation pertaining to the licensing process for spectrum licences of the AWS-3 band. A completed auction bid form and bid file, which includes the bid amount for each licence or combination of licences for which the bidder is placing a bid, must be placed in a separate, sealed envelope, with only the bidder’s name, complete mailing address, email address, and the name of this licensing process clearly identified on the front of the envelope, and physically delivered to the Manager, Auction Operations, by the receipt deadline for sealed bids. The amount of each bid must reflect the amount that the bidder is willing to pay for the associated licence(s). No bids will be accepted after 12:00 p.m., noon, EST, on the receipt deadline for sealed bids. Following the auction, the Department will publish, on its website (http://www.ic.gc.ca/spectrum), a list of all bids received. The sealed envelopes will be opened and examined by departmental officials following the receipt deadline for sealed bids. To be considered valid, a bid must be equal to or greater than the opening bid price, or, in the case of a package bid for blocks J1 and J2 in a given licence area, the combined opening bid price; the previously submitted deposit must be equal to or greater than the amount of the opening bid price of the licence being bid upon; the bid form must be completed correctly and legibly; and the bid must be submitted by a qualified bidder. Where a bid is placed on a licence on which the bidder is not eligible to bid, that bid will be ignored. Only valid bids will be used to determine the provisional winning bid(s). Bids for the set-aside block can only be made per licence; the winning bid will be the highest bid for each licence. For the open-bidding blocks within a Tier 2 licence area, bids can be made as a package bid for both of the licences and/or for individual licences within a given area. The winning bid(s) in each service area will be the greater of either the highest package bid or the highest sum of bids on individual licences. In each service area, bidders are able to win, at most, one of the bids they placed on the open-bidding blocks. For example, a bidder that places bids for each of the individual blocks but not for the package would only be able to win one of the blocks. A reserve bid at the opening bid price will be included in the determination of provisional winning bidders and the prices to be paid for each open-bidding and set-aside licence within a given service area. In this process, it is as if Industry Canada is a bidder in the auction, placing a bid on all licences at the opening bid price. For the open-bidding blocks, including a reserve bid for both licences ensures that the incremental value that a bidder would be prepared to pay for an additional licence is at least the opening bid price of that licence. The two reserve bids for the open-bidding blocks within a service area will not be treated as a package, but rather as having been placed by different bidders. Therefore, in all instances where there is no second bid, the opening bid prices noted in Section 7.3 will be considered the second highest bid (see Annex C for bidding examples). To mitigate the possibility of a tie, bidders are encouraged not to bid in round figures. In the event of a tie, bidders involved in the tie will be requested to enter a second sealed bid in an attempt to break the tie. If required, the Department will provide tied bidders the details of the procedure to submit further bids to break the tie. Should there be a second tie, bidders will be requested to enter a third sealed bid in an attempt to break the tie. This procedure will be repeated until there is no tie. Following final payment for auctioned licences, the Department will publish on its website a list of all bids received, including bidder names and bid amounts, the name of the provisional licence winner(s) and the licence(s), if any, that did not receive bids. The Department will also notify the provisional winning bidder(s) and inform them of payment requirements. Given that there were no comments received and that the post-auction process aligns with other auction processes, Industry Canada will implement the post-auction process as proposed. D20 – The following subsections 11.1 to 11.3 outline the AWS-3 post-auction process. Within 10 business days following the announcement of provisional winners, each provisional licence winner will be required to submit 20% of its final payment. The remaining portion, 80% of the final payment, will be due within 30 business days of the announcement of the provisional licence winners. Failure by the winning bidder to make these final payments in a timely fashion will result in the licence not being issued, and the bidder will be subject to the applicable forfeiture penalty (see Section 11.2 — Forfeiture Penalties). These final payments will be non-refundable. If the licence winner fails to make these payments within the specified period, then the provisional winner's irrevocable standby letter of credit will be drawn upon. Following the conclusion of the auction, winning bidders that fail to comply with the specified payment schedule as outlined in the Table of Key Dates, or fail to come into compliance with the eligibility requirements of the Radiocommunication Regulations, will forfeit their bids and will no longer be deemed to be a provisional licence holder. Furthermore, non-compliant bidders will be subject to a penalty in the amount of the difference between the forfeited licence payments and the eventual revenue from payments or fees for the licence(s), if the eventual revenues are lower than the forfeited licence(s) payment(s) – to be determined by a subsequent licensing process. This is referred to as the forfeiture penalty. In the event of licence forfeiture, the bidder's irrevocable standby letter of credit will be drawn upon for the full amount of the interim proxy forfeiture penalty, which will be the full amount bid for the licence(s) forfeited. If the interim proxy forfeiture penalty is greater than the full amount of the bidder's irrevocable standby letter of credit, combined with any partial payment, or if the letter of credit has been returned or has expired, then the difference will be owing and payable to the Receiver General for Canada. A bidder that forfeits on a licence (or any of that bidder's affiliated and associated entities) may not be eligible to bid on any subsequent licensing process for this band. Industry Canada will issue spectrum licences to provisional winners upon completion of payment of the sum of their bids and the sum of their penalties, if any. Industry Canada will consider making unassigned licences available for licensing through an alternative process, which could include a subsequent auction at a later date following the close of the initial auction. The timing and form of such a process will depend on the demand for the available licences. Industry Canada will conduct a public consultation should it consider it necessary. Following the end of the initial licence term, licensees will have a high expectation of renewal. New licences will be issued for a subsequent term through a formal renewal process unless the Minister determines that a breach of licence condition has occurred, a fundamental reallocation of the spectrum to a new service is required, or an overriding policy need arises. In the absence of the previously outlined determinations, the renewal process facilitates the continued provision of services by existing licensees. As part of the licence renewal process, the Minister of Industry retains the power to fix the new terms and conditions of spectrum licences and to amend these during the new term of the licence and in accordance with subsection 5(1) of the Radiocommunication Act. As noted in the FSAC, licence fees that reflect some measure of market value will apply to licences issued through a renewal process. Accordingly, the renewal process will serve to determine whether new licences will be issued, the terms and conditions that will apply to the new licences and the applicable licence fees. Generally, approximately two years prior to the end of the licence term, Industry Canada will review whether there is a need for a fundamental reallocation of the spectrum to a new service, or whether an overriding policy need has arisen. A review of the licensee's continued compliance with the conditions of licence will also begin. Industry Canada will launch a public consultation to discuss whether, in light of the above-noted issues, new licences should be issued for a subsequent term. The consultation paper will also propose, and invite comments on, licence conditions and fees that would apply during the subsequent licence term. Frequency allocations are an important first step in developing spectrum utilization policies that foster the implementation of new radiocommunication services. Modifications to the CTFA are intended to reflect the public interest in introducing new wireless services that benefit Canadians and respond to marketplace demands. As a result, the Department proposed several modifications to the CTFA to allow for the implementation of new commercial mobile radio services in the AWS-3 band. Currently, the CTFA includes a primary allocation to the fixed service and a secondary allocation to the mobile service in the band 1755-1780 MHz. The mobile service includes domestic footnote C5, which limits the mobile use to the Government of Canada. The CTFA also includes domestic footnote C37 to indicate the possible designation of the bands 1755-1780 MHz, 2020-2025 MHz and 2155-2180 MHz to AWS, subject to future consultation. modify footnote C37 (CAN-06) to remove the bands 1755-1780 MHz and 2155-2180 MHz. Of respondents who commented on proposed changes to the CTFA, all were in agreement. As no objections were raised with respect to the proposals, no further consideration is required. The Department will modify the CTFA as shown below. C5 For the exclusive use of the Government of Canada. C37 (CAN-14) The designation of the band 2 020-2 025 MHz for Advanced Wireless Services may be the subject of a future public consultation. As discussed in the Consultation, the band 1755-1780 MHz is licensed to some legacy fixed point-to-point microwave links and the band 2155-2180 MHz is licensed to some fixed MCS/MDS systems. Both bands are subject to moratoriums on new fixed licensing and in the case of the band 2155-2170 MHz, a transition policy for fixed systems has been in place since 2007. Similar to the transition plans for the PCS and AWS-1 bands, Industry Canada proposed that these incumbent fixed licensees be afforded a reasonable notification period before displacement following the AWS-3 licensing process. The Department also proposed that the transition policy be based on the displacement of incumbents on a "where necessary" basis. The continued operation of existing microwave systems would be permitted if it does not prevent the timely deployment of planned AWS-3 systems. All respondents who commented on the proposed incumbent transition plan were in agreement. As no objections were raised with respect to the proposal, no further consideration is required. Fixed licensees that are preventing the deployment of AWS-3 systems are subject to displacement after receiving notification from the Department. Industry Canada will send such notifications in cases where an AWS-3 licensee demonstrates that the incumbent is preventing deployment. Note that this does not prevent the parties in question from reaching arrangements between themselves whereby both operations can be accommodated. iii. another time frame that is mutually acceptable between the new licensee and the incumbent. The Department proposed to harmonize its technical rules with those of the United States to the extent feasible to ensure that Canadians have access to equipment that can be used throughout Canada and the United States. Harmonization will allow for economies of scale, which may lead to lower cost equipment for Canadian consumers, facilitate cross-border coordination and support the efficient use of the radio spectrum. This approach is also consistent with enabling guideline h) of the SPFC, which states that "spectrum policy and management should support the efficient functioning of markets by…harmonizing spectrum use with international allocations and standards, except where Canadian interests warrant a different determination." The Department also proposed to identify detailed technical requirements in an applicable Standard Radio System Plan (SRSP) and Radio Standards Specification (RSS) and to develop these standards in consultation with stakeholders, including the Radio Advisory Board of Canada. A summary of the proposed technical rules was outlined in Annex D of the Consultation. With one exception, everyone who commented agreed with the proposal to harmonize technical rules with those of the United States. TELUS supported the proposed technical rules with one minor revision and an amendment. Specifically, TELUS proposed to clarify the out-of-band emission limit to specify an out-of-band limit "at and beyond" the band edges 1755 MHz, 1780 MHz, 2155 MHz and 2180 MHz to protect adjacent services. The proposed text specified an out-of-band emission limit at the band edges. TELUS also noted that the technical rule proposals did not specify a measurement bandwidth for out-of-band emissions and suggested that the Department align its rules with those specified in RSS-139, Advanced Wireless Services Equipment Operating in the Bands 1710–1755 MHz and 2110–2155 MHz, which applies to the AWS-1 band. Specifically, for measuring OOB emission limits, TELUS proposed to utilize 1% of emission bandwidth within the first 1 MHz outside the operating frequency block, and 1 MHz bandwidth beyond the first 1 MHz outside the operating frequency block. It is the Department's intention to harmonize Canadian technical rules, which were outlined in Annex D of the Consultation, with U.S technical rules to the extent feasible. The proposed clarifications are noted. Industry Canada will develop an SRSP and an RSS for the technical rules for the AWS-3 band. These will be developed in consultation with the industry, including the Radio Advisory Board of Canada (RABC). D23 – The Department will publish an SRSP and an RSS to establish the technical rules for systems operating in the commercial mobile spectrum in the AWS-3 band. D24 – The Department will harmonize the technical rules for the AWS-3 band with those of the United States to the extent feasible and will establish these technical rules in consultation with the industry, including the RABC. Industry Canada will accept written questions seeking clarification of the rules and policies set out in this Framework from the date of publication of the decision up to three weeks before the application deadline. Every effort will be made to post the questions received, along with Industry Canada's written responses, in the shortest time frame possible. Questions that are of a similar nature and subject matter may be grouped and summarized. Questions regarding bidding procedures will be addressed in mail-out packages intended for qualified bidders, and will not be included in this clarification process unless they are deemed to be critical information for potential bidders requiring an immediate response. These answers will be considered as clarification of the policies set out in this Framework. Applicants are encouraged to submit questions as soon as possible. Industry Canada may also amend or supplement the auction rules and procedures contained in this Framework. Any such amendment or supplement will be published on Industry Canada's website and will be sent to all qualified bidders. Questions regarding the AWS-3 auction may be sent to: Manager, Auction Operations at ic.spectrumauctions-encheresduspectre.ic@canada.ca. All spectrum-related documents referred to in this paper are available on Industry Canada's Spectrum Management and Telecommunications website at http://www.ic.gc.ca/spectrum. As mentioned in Section 4, parts of the band in specific geographic areas along the Canada-United States border are expected to be encumbered to some extent by U.S. government incumbent use. Most of these users will be transitioned out of the band by mid-2020 but in some areas they will remain indefinitely. To assist potential bidders to assess the impact of the U.S. government use on AWS-3 operations, Industry Canada has provided a preliminary analysis of the potentially affected areas where AWS-3 licensees may be required to coordinate with U.S. government users. The information in Table A1 was derived using publicly available information published by the NTIA from July through September 2014. Footnote 11 Industry Canada makes no representation or warranties about the accuracy and completeness of this analysis. 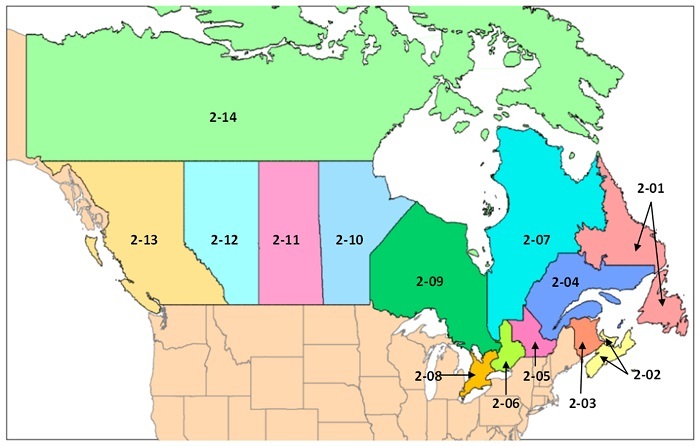 The table below shows the approximate geographic areas (within each Tier 2 service area) and time frame (in months from the award of licences in the U.S.) during which Canadian AWS-3 licensees may be required to coordinate their operations with U.S. government users. The number of months represents the maximum amount of time that U.S. incumbents will remain in the band. Potential bidders are strongly encouraged to undertake their own analyses of potential impacts to their use of the spectrum in specific geographic areas. As noted in Section 4, licensees are strongly encouraged to consult the NTIA's transition plan and to undertake their own analyses of the impacts of U.S. incumbent operations near the Canada-United States border in the 1755-1780 MHz portion of the AWS-3 band. This figure shows a map of Canada illustrating the Tier 2 service areas from the table B1 above. Industry Canada will use a second-price rule to determine the prices to be paid such that the price for a winning bidder will be at least the opening bid price, but no higher than the actual amount bid. Second prices are often referred to as Vickrey prices and represent the opportunity cost of the bidder winning the licence or package. More specifically, Industry Canada will apply bidder-optimal core prices and use the "nearest Vickrey" approach in determining the prices. Bids for the set-aside blocks can be made per licence; the winning bid will be the highest bid for each licence. For the open-bidding blocks, bids can be made as a package bid for both of the licences and/or for individual licences. The winning bid in each service area will be the greater of either the highest package bid or the highest sum of the bids on individual licences. To mitigate the possibility of a tie, bidders are encouraged not to bid in round figures. In the event of a tie, tied bidders will be requested to enter a second sealed bid in an attempt to break the tie. Should there be a second tie, bidders will be requested to submit a third sealed bid in an attempt to break the tie. This procedure will be repeated until there is no tie. The second or Vickrey price for each winning bidder (known as "Bidder J" in this explanation) is calculated as follows. First, from the value of the winning combination, subtract Bidder J's winning bid (value A). Next, recalculate the winning combination for the hypothetical situation in which all Bidder J's bids are excluded, as if Bidder J had not participated (value B). The Vickrey price for Bidder J is calculated as the value of the winning combination with all Bidder J's bids excluded (value B) minus the sum of the winning bids for all bidders other than Bidder J (value A); that is, value B minus value A. This is the minimum amount that the winning bidder could have bid in order to still have won, given the bids of all other bidders. For the set-aside blocks, the Vickrey price for winning bidders will be the second highest bid on the licence or, should there only be one bidder for a particular licence, the opening bid amount. For the open-bidding blocks, the Vickrey price(s) could depend on package bids and/or bids for the individual licences as well as the opening bid prices for the licences. In addition, with package bidding, an extra payment beyond the Vickrey prices is sometimes required as a result of interaction between overlapping bids. In the event that an extra payment is required, the payment will be split evenly among the affected bidders. First condition: The price for a winning bid must be greater than or equal to the opening bid price(s) for the licence(s) included in the bid, but not more than the dollar amount of the winning bid. Second condition: The set of prices must be sufficiently high that there is no alternative bidder, or group of bidders, prepared to pay more than any winning bidder or group of winning bidders. If there is only one set of prices that meets the first and second conditions, this determines the prices to be paid. Third condition: If there is more than one set of prices that fulfils the first and second conditions, the set (or sets) of prices minimizing the sum of prices across winning bidders is (are) selected. If there is only one set of prices satisfying these three conditions, this set determines the prices. Fourth condition: If there is more than one set of prices that satisfies the first three conditions, the set of prices that minimizes the sum of squares of differences between the prices and the Vickrey prices will be selected. This approach for selecting among sets of prices that minimize the sum of prices across winning bidders is referred to as the "nearest Vickrey" approach. These conditions characterize a unique set of prices such that each winning bidder pays no more than the dollar amount of its winning bid and pays at least the opening bid price(s). Industry Canada staff will calculate the set of prices for the open-bidding block and set-aside block in each service area that meet the conditions outlined above. The following is an example of how prices are calculated. This example is based on the Spectrum Auction Design paper by P. Cramton (http://www.cramton.umd.edu/papers2005-2009/cramton-spectrum-auction-design.pdf). The bids of the five bidders are represented in Figure C1. In this example, the highest value combination of bids would assign licence A to Bidder 1 and licence B to Bidder 2, generating $48 in value. There is no other assignment of the licences that yields a higher value. To calculate the Vickrey price for Bidder 1, its winning bid ($28) is subtracted from the value of the winning combination ($48), resulting in $20. Next, the winning combination of packages is recalculated for the hypothetical situation in which Bidder 1's bids are excluded. The best assignment, excluding Bidder 1, assigns licence A to Bidder 4 at $14 and licence B to Bidder 2 at $20, resulting in $34. The Vickrey price for Bidder 1 is the value of the winning combination of packages with all Bidder 1's bids excluded ($34) less the sum of the winning allocation stage bids for all bidders other than Bidder 1 ($20); that is, its Vickrey price is $14 ($34 – $20). Similarly, to calculate the Vickrey price for Bidder 2, its winning bid ($20) is subtracted from the value of the winning combination ($48), resulting in $28. Next, the winning combination of packages is recalculated for the hypothetical situation in which Bidder 2's bids are excluded. The best assignment, excluding Bidder 2, assigns licence A to Bidder 1 and licence B to Bidder 5, resulting in a value of $40. The Vickrey price for Bidder 2 is the value of the winning combination of packages with all Bidder 2's bids excluded ($40) less the sum of the winning allocation stage bids for all bidders other than Bidder 2 ($28); that is, its Vickrey price is $12 ($40 - $28). Hence, the Vickrey outcome is for Bidder 1 to pay $14 for licence A and for Bidder 2 to pay $12 for licence B. Total revenues with these payments are $14 + $12 = $26. As shown in Figure C1, this means that Bidder 1 can reduce its bid to $14 before being displaced by Bidder 4. Similarly, Bidder 2 can reduce its bid to $12 before being displaced by Bidder 5. This figure is a graph illustrating the example above with the five bidders, 1, 2, 3, 4 and 5, bidding for two licences, A and B. This illustration demonstrates how to calculate prices using a second-price rule and why an additional payment beyond second prices is sometimes required. However, these payments sum to $26, which is less than Bidder 3's bid of $32 for both licences A and B. Therefore, Bidder 1 and Bidder 2 must split an additional payment of $6 ($32 - $26), to ensure that their combined payment is greater than that of Bidder 3, satisfying the condition that no other bidder or group of bidders was prepared to pay more for the licences in question. That is, Bidder 1 and Bidder 2 must pay, collectively, at least $32. The additional payment of $6 is split equally between the two bidders. Each bidder is therefore paying an additional $3 above its Vickrey price, with Bidder 1 paying $17 ($14 + $3) and Bidder 2 paying $15 ($12 + $3), as shown in Figure C1. The following examples illustrate different bidding scenarios, the provisional winning bid(s) as well as the price calculations for each. Let us assume that there are three bidders interested in the set-aside block (30 MHz) in Tier 2-05. Bidder 1 places a bid of $22,000,000, Bidder 2 places a bid of $20,600,000 and Bidder 3 places a bid of $24,500,000. Bidder 3 would be declared the provisional winner and would be required to pay the second highest bid value of $22,000,000. Let us assume that there are three bidders interested in the set-aside block (30 MHz) in Tier 2-03. Bidder 1 places a bid of $1,317,000, Bidder 2 places a bid of $1,400,000 and Bidder 3 places a bid of $1,400,000. Bidders 2 and 3 have tied with a bid of $1,400,000 and are asked to re-bid. Let us assume that there is only one bidder interested in the set-aside block in Tier 2-12. Bidder 1 places a bid of $10,700,000. Bidder 1 would be declared the provisional winner. Since there no other bids on the licence, Bidder 1 would pay the opening bid price of $9,900,000. Let us assume that there are three bidders interested in the open-bidding blocks, J1 and J2, in Tier 2-07. Bidder 1 submits one bid of $26,200,000 for a package of both licences. Bidder 2 submits three bids: $12,000,000 for J1, $12,000,000 for J2 and $25,000,000 for a package of both licences. Bidder 3 also submits three bids: $12,500,000 for J1, $13,000,000 for J2 and $26,000,000 for a package of both licences. Bidder 1 would be declared the provisional winner as its package bid is higher than the package bids of Bidders 2 and 3 as well as the sum of a combination of their bids for individual licences. To calculate the Vickrey price for Bidder 1, its winning bid ($26,200,000) is subtracted from the value of the winning combination ($26,200,000) resulting in $0. Next, the winning combination is recalculated for the hypothetical situation in which Bidder 1's bids are excluded. The best assignment, excluding Bidder 1, assigns both J1 and J2 to Bidder 3 at $26,000,000. The Vickrey price for Bidder 1 is the value of the winning combination with all of Bidder 1's bids excluded ($26,000,000) less the sum of the winning bids for all bidders other than Bidder 1 ($0); that is, its Vickrey price is $26,000,000 ($26,000,000 - $0). Let us assume that there are three bidders interested in the open-bidding blocks, J1 and J2, in Tier 2-01. Bidder 1 submits three bids: $310,000 for J1, $308,000 for J2 and $650,000 for a package of both licences. Bidder 2 submits two bids: $400,000 for J1 and $400,000 for J2. Bidder 3 also submits two bids: $345,000 for J1 and $350,000 for J2. In this case, the sum of Bidder 2's bid for J1 and Bidder 3's bid for J2, with total bids of $750,000, would be the highest and Bidders 2 and 3 would be declared the provisional winners. To calculate the Vickrey price for Bidder 2, its winning bid ($400,000) is subtracted from the value of the winning combination ($750,000), resulting in $350,000. Next, the winning combination is recalculated for the hypothetical situation in which Bidder 2's bids are excluded. The best assignment, excluding Bidder 2, assigns J1 to Bidder 1 at $310,000 and J2 to Bidder 3 at $350,000, resulting in $660,000. The Vickrey price for Bidder 2 is the value of the winning combination with all of Bidder 2's bids excluded ($660,000) less the sum of the winning bids for all bidders other than Bidder 2 ($350,000) that is, its Vickrey price is $310,000 ($660,000 - $350,000). To calculate the Vickrey price for Bidder 3, its winning bid ($350,000) is subtracted from the value of the winning combination ($750,000), resulting in $400,000. Next, the winning combination is recalculated for the hypothetical situation in which Bidder 3's bids are excluded. The best assignment, excluding Bidder 3, assigns J1 to Bidder 1 at $310,000 and J2 to Bidder 2 at $400,000, resulting in $710,000. The Vickrey price for Bidder 3 is the value of the winning combination with all of Bidder 3's bids excluded ($710,000), less the sum of the winning bids for all bidders other than Bidder 3 ($400,000), that is, its Vickrey price is $310,000 ($710,000 - $400,000). Hence, the Vickrey outcome is for Bidder 2 to pay $310,000 for licence J1 and Bidder 3 to pay $310,000 for licence J2. However, these prices sum to $620,000 which is less than Bidder 1's package bid of $650,000 for both licences J1 and J2. Therefore, Bidder 2 and Bidder 3 must split an additional payment of $30,000 ($650,000 - $620,000), satisfying the condition that no other bidder or group of bidders was prepared to pay more for the licences in question. Therefore, Bidder 2 and Bidder 3 must pay, collectively, at least $650,000. The additional payment would be split equally between the two bidders, and with each bidder paying an additional $15,000 above its second price for a total payment of $325,000 ($310,000 + $15,000). The following Conditions of Licence will apply to AWS-3 licences. The term of this licence is 20 years. At the end of this term, the licensee will have a high expectation that a new licence will be issued for a subsequent term through a renewal process unless a breach of licence condition has occurred, a fundamental reallocation of spectrum to a new service is required, or an overriding policy need arises. The licensee must comply on an ongoing basis with the applicable eligibility criteria in subsection 9(1) of the Radiocommunication Regulations . The licensee must notify the Minister of Industry of any change that would have a material effect on its eligibility. Such notification must be made in advance for any proposed transactions within its knowledge. This licence is transferable in whole or in part (divisibility), in both bandwidth and geographic dimensions, subject to Industry Canada's approval. A subordinate licence may also be issued in regard to this licence. Industry Canada's approval is required for each proposed subordinate licence. The licensee must comply with transition policies set out in SLPB-007-14, Technical, Policy and Licensing Framework for Advanced Wireless Services in the Bands 1755-1780 MHz and 2155-2180 MHz (AWS-3) . The licensee must comply with Client Procedures Circular CPC-2-0-03, Radiocommunication and Broadcasting Antenna Systems , as amended from time to time. The licensee must provide, and maintain, up-to-date technical information on a particular station or network in accordance with the definitions, criteria, frequency and timelines specified in Client Procedures Circular CPC-2-1-23, Licensing Procedure for Spectrum Licences for Terrestrial Services , as amended from time to time. The licensee is subject to, and must comply with, the Radiocommunication Act and the Radiocommunication Regulations , as amended from time to time. The licensee must use the assigned spectrum in accordance with the Canadian Table of Frequency Allocations and the spectrum policies applicable to this band, as amended from time to time. The licence is issued on condition that all representations made in relation to obtaining this licence are all true and complete in every respect. The licensee must comply on an ongoing basis with the technical aspects of the appropriate Radio Standards Specifications (RSS) and Standard Radio System Plans (SRSP), as amended from time to time. Where applicable, the licensee must use its best efforts to enter into mutually acceptable agreements with other parties for facilitating the reasonable and timely development of their respective systems, and to coordinate with other licensed users in Canada and internationally. The licensee must comply with the obligations arising from current and future frequency coordination agreements established between Canada and other countries and shall be required to provide information or take actions to implement these obligations as indicated in the applicable SRSP. Although frequency assignments are not subject to site licensing, the licensee may be required through the appropriate SRSP to furnish all necessary technical data for each relevant site. The licensee operating as a telecommunication common carrier using the spectrum for voice telephony systems must, from the inception of service, provide for and maintain lawful interception capabilities as authorized by law. The requirements for lawful interception capabilities are provided in the Solicitor General's Enforcement Standards for Lawful Interception of Telecommunications (Rev. Nov. 95). These standards may be amended from time to time. The licensee may request the Minister of Industry to forbear from enforcing certain assistance capability requirements for a limited period of time. The Minister, following consultation with Public Safety Canada, may exercise the power to forbear from enforcing a requirement or requirements where, in the opinion of the Minister, the requirement is not reasonably achievable. Requests for forbearance must include specific details and dates indicating when compliance to the requirement can be expected. The licensee must invest, as a minimum, two percent of its adjusted gross revenues resulting from the use of this licence, averaged over the term of the licence, in eligible research and development (R&D) activities related to telecommunications. Eligible R&D activities are those which meet the definition of scientific research and experimental development adopted in the Income Tax Act , as amended from time to time. Adjusted gross revenues are defined as total service revenues, less inter-carrier payments, bad debts, third party commissions, and provincial goods and services taxes collected. The licensee is exempt from R&D expenditure requirements if it, together with all affiliated licensees that are subject to the R&D condition of licence, has less than $1 billion in annual gross operating revenues from the provision of wireless services in Canada, averaged over the term of the licence. For this condition of licence, an affiliate is defined as a person who controls the carrier, or who is controlled by the carrier or by any person who controls the carrier, as per subsection 35(3) of the Telecommunications Act . Licensees will be required to demonstrate to the Minister of Industry that this spectrum has been put to use as specified in Annex E of SLPB-007-14, Technical, Policy and Licensing Framework for Advanced Wireless Services in the Bands 1755-1780 MHz and 2155-2180 MHz (AWS-3) within eight years of the initial issuance of the licence. When the spectrum is put to use, it shall be used to provide services predominantly to Canadians within the service area. Where a licence is transferred during the initial eight years, the requirement for the new licensee to deploy will continue to be based on the initial licence issuance date. The licensee must comply with the mandatory antenna tower and site sharing requirements set out in Client Procedures Circular CPC-2-0-17, Conditions of Licence for Mandatory Roaming and Antenna Tower and Site Sharing and to Prohibit Exclusive Site Arrangements , as amended from time to time. The licensee must comply with the roaming requirements set out in Client Procedures Circular CPC-2-0-17, Conditions of Licence for Mandatory Roaming and Antenna Tower and Site Sharing and to Prohibit Exclusive Site Arrangements ,Footnote 12 as amended from time to time. other information related to the licence as specified in any notice updating the reporting requirements as issued by Industry Canada. All reports and statements are to be certified by an officer of the company and submitted, in writing, within 120 days of the licensee's fiscal year-end. Confidential information provided will be treated in accordance with subsection 20(1) of the Access to Information Act . Where a licensee holds multiple licences, spectrum implementation reports should be broken down by service area. This information, including the extent of implementation and spectrum usage, is important for analyzing each licensee's individual performance against its conditions of licence. In addition, it allows Industry Canada to monitor the effectiveness of these conditions in meeting the policy objectives regarding the band and the Department's intent that the spectrum be deployed in a timely manner for the benefit of Canadians. The Minister of Industry retains the discretion to amend these terms and conditions of licence at any time. AWS-1 refers to the bands 1710-1755 MHz and 2110-2155 MHz. The current band classes – 4 and 10 – only extend to 1755/2155 MHz and 1770/2170 MHz, respectively. See also http://www.ntia.doc.gov/category/500-mhz-initiative and http://www.ntia.doc.gov/category/aws-3-transition. As noted in the FSAC, there are various measures available in an auction to promote a competitive marketplace if required, notably set asides and spectrum caps. These measures can address issues of market power and competition. The factors that Industry Canada may consider when deciding upon use of a competitive measure are set out in the FSAC. A spectrum set aside prohibits certain entities from bidding on specific blocks of spectrum. The subscriber market share for Ontario will apply for the licence area 2-06, Eastern Ontario and Outaouais. For the Tier 2-14 licence area (Yukon, Northwest Territories and Nunavut), only the national market share criteria will apply. Definition from 700/2500 MHz Policy Framework Decision B3-2 (http://www.ic.gc.ca/eic/site/smt-gst.nsf/eng/sf10121.html). The reference data for the evaluations will rely on the most recently available CRTC Communications Monitoring Report . The subscriber market share for Ontario will apply for the licence area 2‑06, Eastern Ontario and Outaouais. For the Tier 2-14 licence area (Yukon, Northwest Territories and Nunavut), only the national market share criteria will apply. Definition from Policy and Technical Framework: Mobile Broadband Services (MBS) — 700 MHz Band, Broadband Radio Service (BRS) — 2500 MHz Band (http://www.ic.gc.ca/eic/site/smt-gst.nsf/eng/sf10121.html). The reference data for the evaluations will rely on the most recently available CRTC Communications Monitoring Report at http://www.crtc.gc.ca/eng/publications1.htm. Refers to terrestrial wireless networks. Coverage areas (for the purposes of verifying coverage) are those areas where devices being offered to support service can successfully connect to the bidder's existing network. Transfers of commercial mobile spectrum are subject to review in accordance with CPC-2-1-23, Licensing Procedure for Spectrum Licences for Terrestrial Services , and take into consideration decisions released in the Framework Relating to Transfers, Divisions and Subordinate Licensing of Spectrum Licences for Commercial Mobile Spectrum . CPC-2-0-17 will be amended accordingly to include the AWS-3 band.